As the Lankan Government gives itself a hearty pat on its back and calls for a rousing round of hurrahs over its victory last Saturday at the provincial council elections, the UN’s General Secretary Ban Ki-moon on Tuesday raps the Government on its bare knuckles; and, ‘recalling the commitments made to him on accountability by the President of Sri Lanka in their Joint Statement of 2009′, urges Lanka to engage “constructively” and cooperate with its human rights body to implement the international inquiry. This latest harangue from the UN makes it clear that the Lankan Government has not earned any reprieve it hoped to gain by the results of last week’s local elections. The timing of the polls to fall the day after the crucial Geneva vote was calculated on the basis that the negative international vote will be equalized by a positive local show of approval. UPFA die hards suffered the belief that a UPFA victory will be hailed as an endorsement of the UPFA Government’s actions and stance and the international community’s strident voice will be effectively silenced or made to sound hollow by a people’s verdict in the Government’s favour. Whilst, no doubt, the recent victory strengthened the hand of the Government, gave it a new and fresh legitimacy to continue to exercise power as the democratically elected Government of this nation, it did not deliver absolution to the Government’s alleged human rights record nor vindicate its seemingly intransigent stance. The verdict of two provinces both dominated overwhelmingly by the Singhalese — the Southern Province with over 95 per cent Sinhalese, the Western with over 80 percent according to 2012 government census — in favour of the Sinhalese dominated government cannot be considered as a form of dispensation for alleged human rights transgressions allegedly committed by a majority race against a minority ethnic grouping and as such do not hold water in western eyes. This is especially so when contrasted against the Sinhala verdict, the allegedly victimised Tamil-dominated north voted overwhelmingly against the Government in last September’s elections with its elected council proceeding thereafter to unanimously call the United Nations for an international war crimes probe three weeks ago. The great divide between the two races is distinctly drawn and clear; and popularity polls cannot determine who best bears the baton of the just and the right. In the light of this, the provincial elections last week were merely a barometer to gauge government popularity amongst Sinhala voters and not a licence to ignore reconciliation demands or to postpone implementation of LLRC recommendations as demanded by the world body. Hallelujahs sung by the zealous believers attesting the divine infallibility of their own household gods are not providential signals mandating one to do as one wishes and look askance at minority grievances, when a few beyond the pale allege victimization and injustice. The same applies to the TNA and to the Tamils they represent. Their own Tamil want for Eelam cannot pass muster merely because their brethren give echo to their wishes. Now the UN waits for Lanka to answer: whether she will extend her cooperation? The die hards of jingoist bravado can tub thump a resounding ‘No’ for all they may to the fulsome delight of their adoring kith and kin but it will not water international roses to bloom in Lanka’s harrowed garden but only provoke cacti to nestle and attract more nettle at Lanka’s prickly attitude. As much as it may seem anathema to the Government to comply with Pillay’s probe, as unbearable as it is to suffer the degradation of international interference, as hard as it is to exercise continence and not puke the insolence thrown upon it by Pillay and the Tamil Diaspora, the question remains: can Lanka, with its fast dwindling friends and fortunes, refuse? The straw filled Sinhala fanatics that rooted remain in bone dry fields of half baked patriotism may chillingly point to the sleeping Sinhala lion and warn the world to wake it at their peril without realising the lion, having slept too long in complacency, may now be dead. Pseudo patriots and wayward monks may take to the seditious streets and tattoo their breasts with ‘death before surrender’ Lanka Matha, we will die for you,’ graffiti but will the bluster stem the tide? Will a bulwark of belligerent rhetoric stop the Geneva tsunami that now stands poised to lash Lanka’s fragile shores with ample warning and with alarming force? Is that the considered answer Lanka is going to give the waiting world? That onerous duty has fallen upon the Lankan Government and the manner of its discharge will determine the fate of the Lankan people, both Sinhalese and Tamils. For international sanctions, like the tidal wave, is a great equalizer; and will hit all indiscriminately, without exception, without mercy and without remorse. The Tamil National Alliance presently hell bent on upping the ante with anti Sinhalese propaganda should remember to exercise their own hate rattling with caution and responsibility and not goad the government to a position from which no self respecting government can politically back down. They should not lose sight of the fact that, in the event of Lanka becoming a pariah state shunned by the international league of civilized nations, the hardships that will ensue will have a devastating effect on the Tamils of Lanka too. Enough that the Tamils suffered for thirty years under the abhorred tyrant of terror Prabhakaran than they be forced now to face a repeat performance of a fading inferno when peace has been restored to the land and when they are beginning to pick the pieces of their shattered lives. Or is it part, nay the very whole of the TNA and the Diaspora funded agenda to see all international credit withdrawn, crippling sanctions imposed, vital medicines embargoed export markets closed, imports restricted; to see their own people brought down to their knees, to see the land turned into a scorched bed of hunger, disease and death where hope never comes that comes to all? For all the concerns expressed as to the welfare of their own people, is it the underlying aim of the TNA to see all embroiled in the ensuing horror so that in that black night of anarchy by churning the chaos a utopian Tamil Eelam could be sprung to existence even as the milky ocean was churned to bring forth amritha, the nectar of immortality in Hindu mythology? The only faint flicker of hope that made a smile of relief cross Lanka’s despair wracked visage was the surprise abstention of India from casting its vote for the crucial Geneva resolution at the eleventh hour. Comforting as that decision was, it can however provide no tenable lifeline its purpose being not to save Lanka from the doldrums but to safeguard India’s own position and to preempt an ‘intrusive’ inquiry in the future into alleged war crimes of the past committed by the Indian Army during its tenure of occupation of northern Lanka in the eighties. But to give India the benefit of doubt as to the sincerity of her motives, the abstention may also have been to assuage Lanka’s deep hurt caused by India voting against in the two previous years. a modicum of relief extended to ease Lanka’s resolution woes; a white hanky nailed on its mast to signal a thaw in the Indian chill. Yet one thing jars. The reasons given for the abstention were compelling, so compelling in fact it made one wonder, if they were genuinely held by India, why she did not vote against the resolution as the reasons dictated and thus helped Lanka positively instead of merely abstaining and ruling herself out of the picture. Was abstention India’s way of plunging the knife? Are we to be euphoric that she showed mercy and did not turn the knife in by voting for the resolution? India’s abstention may also have been due to geostrategic reasons. With Lanka reaching out to Pakistani arms and voluntarily succumbing to China’s gravitational pull, India may have decided to mitigate the damage done and bring Lanka back into her own orbit of influence. And who can blame her? With two giant sworn enemies China and Pakistan, both armed with nuclear weapons trained on her, flanking her on either side, insecurity-complex ridden India may have deemed it wiser to spare herself the shrieks at finding a Lankan mouse on her front doorstep. Will dynastic heir or grocer’s son win India’s heart? Tomorrow India goes to the polls. Starting with elections in two states, it will take the world’s most populous democracy 40 days to complete the voting. Only on the 16th of May will the counting begin. Till then India will remain on hold. For the first time two bachelors woo India’s ‘mehendi’ decorated hand. To which deserving suitor will she give her much sought heart? 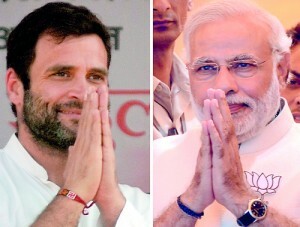 Will it be to the 43-year-old heir of the Gandhi dynasty Rahul or the grocer’s son 63-year-old Modi. The ‘coming soon’ trailer has all the stuff of a Bollywood movie and, as predicted will have a stereotyped ending with the charismatic poor boy made good Modi winning the right to take India to bed. But how will it affect Lanka? Today India is in transition; with her government in limbo until 815 eligible Indians have cast their votes. The political cauldron has begun to boil, the ingredients are still being added, and none can predict for certain how the recipe will finally turn out. Mother’s boy Rahul Gandhi must have a strong anger toward the LTTE for murdering his father Rajiv. But will it be a deciding factor in determining India’s policy towards Lanka’s human rights crisis now that the LTTE has been destroyed by the Lankan Government and the issue has shifted to focus on the rights of the northern Tamil civilian population? But no doubt he will pursue the same general policy as adopted by his Congress party these last few years. Modi, however, is an unknown factor. The loose cannon. He is charismatic. He is controversial. He is also a Hindu die hard, so to speak. Controversy shadows him over the massacre of 2,000 Muslims in 2002 in the post-Godhra riots. Though several probes were conducted, no evidence was found to nail the responsibility for the killings upon him. Being the subject of probes himself, will he approach Lanka’s probe prone plight with sympathy and greater understanding than Manmohan Singh’s nanny ruled Government has done? One thing for sure. Modi who walked away from an arranged marriage once and never returned to it, preferring to be a loner, will be his own man. He will not have a foreign Governess to defer all decisions as Singh had with Italian born Sonia. If he wins by a landslide as predicted it will lessen the power of regional states to exert pressure on the central government. Jayalalitha and her ilk will remain vibrant in Tamil Nad but will be damp squibs in Delhi. The snag, however, is whether nationalistic Modi who waves the Hindu flag stridently will need any pressure from Tamil Nad at all to bat for the Hindu Tamils of Lanka. But then again he is a strong advocate of majority rule which may move him to fathom the Sinhala mentality better. Will he dislodge India from the fence and make her take a stand, either way? Lanka will have to wait to know for certain whether India’s tightrope walk will be hit by Modi on the trapeze. And whilst she waits should formulate a policy based not on friendship alone but one that contains the safety net of mutual interests.